First off, thanks to Mike's Blurb Stuff for having templates that made sense when I was trying to learn how to make templates myself. If you need templates specifically for Blurb books, check it out! The template labeled "Left" is as in on the lefthand side of the book (which, if printed, means the binding would be on the righthand side of the page). Right is, well, the righthand side. If you already know what you're doing, these are 8x10 at 300 DPI. The blue is margins, the green gutter, the red bleed. Do two-page spreads at your own risk :D.
If you don't, that's okay! Read on, and ask me any other questions you have. I'd rather help early on than get something really cool that won't fit anywhere. And if you better know what you're doing with print and can tell I've messed something up, please tell me that too. 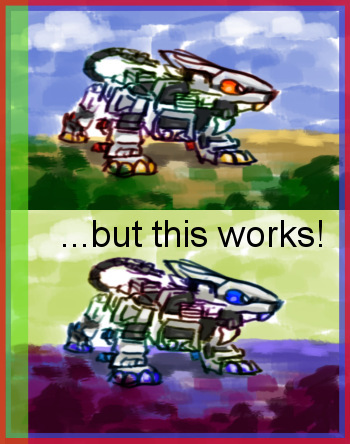 The PNG/BMP versions of the template just have lines and should work in nearly any art program. 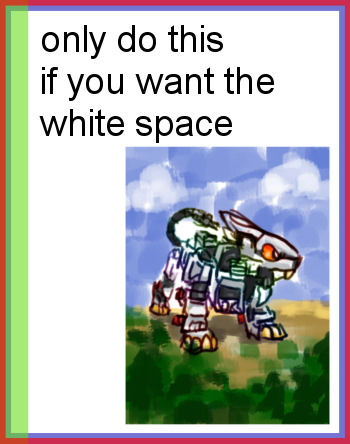 Please do not leave the lines in the final image. Put your pics over them (or better yet, draw on a new layer/layers above them and then delete the liney layer). The PSD version of the template has colored layers and guides on it to mark the bleed, margin, and gutter. Again, don't include any of these colored layers in your final image! The guides may not be visible in all programs; they should be in Photoshop and The GIMP, though. They're not necessary to use the template, just handy for lining pasted images up (turn on Snap To Guides). The ORA (OpenRaster) version is pretty much the Photoshop one sans guides. I made it in case anyone wants to draw with something like MyPaint but doesn't want to convert the PSD. Not got Photoshop? The GIMP (worst image editor name ever, but a well-maintained project) will open PSDs and do a lot of similar things. Also usable for drawing and free are MyPaint, FireAlpaca, openCanvas 1.1, and probably many other things I'm missing. DO NOT resize the templates. They're the size they are because that's the size required if things actually get printed, so if you make them smaller or a different shape, your images won't work. Same goes for scaling up small pics to paste them into a template—a tiny bit of upscaling is probably fine, but a lot of sizing up will make for a blobby mess. All the templates are in portrait (tall way round) rather than landscape (long way). If you send me something landscape and full page, it'll end up tilted on its side and harder to look at. If you have landscape art you want to include, however, you can also stack two 4x5 pieces (allowing for some extra on their edges to match) or otherwise get creative in organizing things. As long as the end result fits, it's good! It's best not to make things really small, however, as ebooks are often read on little (7-8") screens. Again, make sure not to save the guide lines or colored guide layers on top of or into your pictures. They're for your own reference and should not show on the final image. When drawing/pasting into both templates, your image should fill the entire page—or the entire appropriate layer/half of page, if it's one of the half-page ones. The bleed is there for if things actually get printed, but won't be part of the image on the page. It's there to get cut off. That way, you avoid any icky unprinted bits on the edges of your art if the page isn't cut perfectly. In other words, make sure to draw out into it, but don't put anything in the bleed that you want to show up. While they'll be visible on the final page, avoid putting important things (especially text) in the margins and gutter. The margins are near the edge and it'll be potentially awkward or weird-looking visually (unless you're intentionally going for a touching-the-edges effect, which is at your own risk). The gutter is the edge of the book that'll be near the binding, so again, don't put important things there, as they'll be hard to read if it's printed. On all pages, please allow some room compositionwise to add a title/page number and any other things caption you want. Right now that's not on the template, so use your own discretion. Obviously, this is way smaller than you'd actually want to work. 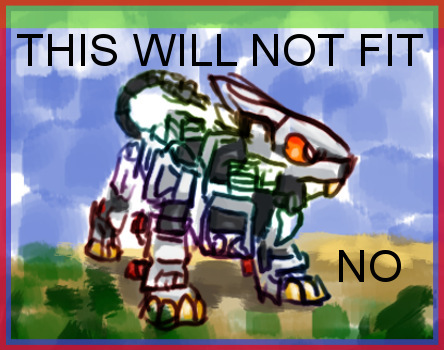 Pretend it's large, and also a magnificant piece of art that I would be proud to print ;p.
Liger Zero here doesn't have parts of its actual Zoidy self straying into the margin bits (or worse, bleed bits), which means it won't get cut off or end up with its body bits awkwardly touching the edges (the worst!). The background, however, heads out into the bleed, so if Liger were printable and got printed, there would be room for slight wibbles in printing/cutting. The image cuts off at the margins...which means the actual page will have white borders. 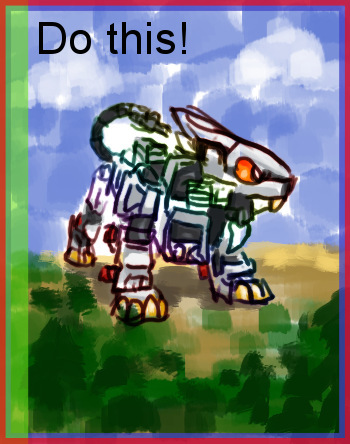 Only do this one if you want to, say, add text or other pics around your image. Or you...really like stray whitespace around things! This, however, is an okay way to include landscape pics! Same with any other collage that tickles your fancy, just keep in mind readability. 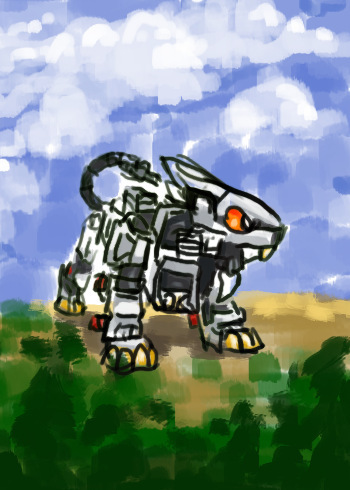 Zoids belong to Takara-Tomy and Shogakukan. Kotobukiya makes the HMM line. This is an unofficial fan project (run by Tilly) and not for profit. All contributed contents (art, writing, etc.) belong to their creators and are used with permission. Please do not repost them without asking!